FC Halifax Town lost 4-1 at Ossett United in the semi-finals of the West Riding County Cup. After a scoreless first half, Tom Greaves scored twice in five minutes to send Halifax on their way to victory. Adam Priestley lashed home a third just after the hour to all but seal United’s place in the final. 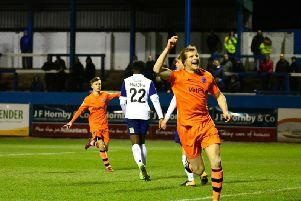 Jos Vietch pulled a goal back for Halifax three minutes from time before Tom Corner netted Ossett’s fourth in stoppage time. Town’s side featured senior players Shaun Rowley, Josh Staunton, Jacob Hanson, James Ferry and Ryan Sellers.